Snowmass deserves its reputation as a world-class mountain biking destination. It's simply amazing, and if you haven't been here, you need to come. 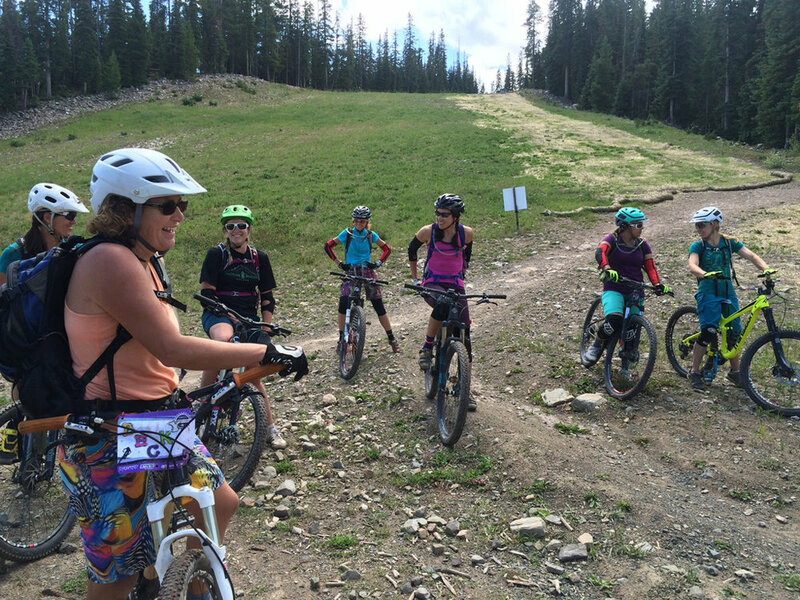 We will take over the Snowmass Bike Park and surrounding trails to teach all levels of riders. Take advantage of the chairlifts to access a trail network suitable for all abilities, ranging from rolling single track to gnarly rock features. From the newbie to cross-country rider to downhill jumper, we have plenty to teach you! Don't be intimidated, join us for this fun weekend of bonding with other ladies over bikes, beers, skills, and smiles. We are confident that no matter what level of rider you are, you will walk away stunned at how much more you love mountain biking after experiencing Snowmass! If you are coming to Snowmass early, join us for early check-in and schwag bag pick-up at The Ranger Station on Friday, August 16 from 4:30 p.m. - 6 p.m. You can make your name plate, grab your t-shirt and schwag bag, and enjoy their Happy Hour specials. Warming fire pits welcome guests onto the outdoor patio, where panoramic mountain views round out the experience. The Ranger Station is conveniently located ski-in, ski-out off the Fanny Hill run, across from the Westin and adjacent to the outdoor stage and fire pit. Our event HQ will take place by the mountainboard course on Fanny Hill (across from the main mall entrance and Venga Venga). You can find us with under the Yeti Cycles tents and next to the Shredly trailer. The best place to park is either in the Parking Garage and take an elevator to Base Camp and the SkyCab up to the Event HQ, or in the free parking lots on Carriage Way. Lots 5, 6, 7 & 8 are closest to the main entrance of the mall which is on the same level as VIDA's Event HQ. Click HERE for directions to Snowmass Village and HERE for a map of parking lots. Four Mountain Sports is offering VIDA participants 20% off rentals and 10% off retail. If you are interested in trying out a DH rig, or would like to upgrade from your current bike, this is a great opportunity to see why full suspension DH bikes can make playing in the bike park more fun! All bike rentals include all the safety gear you need, but full-face helmets, knee/elbow pads and additional body armor are available a la carte. The rental shop is located at the Snowmass Base Village and opens at 9:00 a.m. on Saturday. For equipment information, call 970-923-0430. VIDA is thrilled to partner with the Crestwood Condominiums to provide special lodging rates for VIDA participants. Call 1-800-356-5949 to make reservations and mention that you are with the VIDA MTB Series for exclusive rates. If you are interested in teaming up with other participants, email us and we'll help connect the dots! Lodging discounts are limited to VIDA MTB Series participants and their guests. *does not include tax & service charge of 20.7%. Rooms available on a space available basis. Snowmass is epic. Need proof?